Step into the cabin and you’ll find everything that makes Maserati a top-notch Italian luxury automaker, from a wood and leather steering wheel to hand-stitched leather upholstery and Radica wood trim. Find the new Maserati Quattoporte for sale now near Jacksonville, FL at Maserati Alfa Romeo of Daytona – contact us to set up a test drive! Why Choose Maserati Alfa Romeo of Daytona? The team at Maserati Alfa Romeo of Daytona is here to help drivers in Ormond Beach, FL and its surrounding areas get the kind of luxury and performance they’re looking for in a premium Italian luxury sedan—and that’s exactly what they’ll get with the new Maserati Quattroporte. Get started by applying to finance the Maserati Quattroporte at our dealership, then get to work on valuing your trade-in. When you’re ready, we’ll be here to help you purchase, service, and maintain your Maserati for years to come! 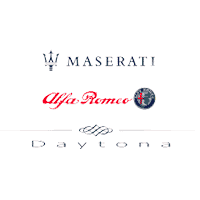 By clicking here, you authorize Maserati Alfa Romeo of Daytona, and its affiliates, to contact you by texts/calls which may include marketing and be by autodialer or pre-recorded messages. Consent is not required to purchase goods or services. 2018 Maserati Quattroporte Champagne S RWD ZF 8-Speed Automatic 3.0L V6 3.0L V6.THIS VEHICLE INCLUDES THE FOLLOWING FEATURES AND OPTIONS: 3.0L V6, 10 Speakers, 4-Wheel Disc Brakes, ABS brakes, Adaptive suspension, Air Conditioning, AM/FM radio: SiriusXM, Anti-whiplash front head restraints, Auto tilt-away steering wheel, Auto-dimming door mirrors, Auto-dimming Rear-View mirror, Automatic temperature control, Bumpers: body-color, Delay-off headlights, Driver door bin, Driver vanity mirror, Dual front impact airbags, Dual front side impact airbags, Electronic Stability Control, Exterior Parking Camera Rear, Four wheel independent suspension, Front anti-roll bar, Front Bucket Seats, Front Center Armrest, Front dual zone A/C, Front reading lights, Garage door transmitter, harman/kardon® Speakers, Heated door mirrors, Heated front seats, High intensity discharge headlights: Bi-Xenon, Illuminated entry, Leather Shift Knob, Low tire pressure warning, Memory seat, Navigation System, Occupant sensing airbag, Outside temperature display, Overhead airbag, Overhead console, Passenger door bin, Passenger vanity mirror, Power door mirrors, Power driver seat, Power moonroof, Power passenger seat, Power steering, Power windows, Radio data system, Radio: AM/FM w/Maserati Touch Control Plus & Nav, Rain sensing wipers, Rear anti-roll bar, Rear fog lights, Rear reading lights, Rear seat center armrest, Rear window defroster, Remote keyless entry, Security system, Speed control, Speed-sensing steering, Speed-Sensitive Wipers, Split folding rear seat, Steering wheel memory, Steering wheel mounted audio controls, Sun blinds, Tachometer, Telescoping steering wheel, Tilt steering wheel, Traction control, Trip computer, Turn signal indicator mirrors, Variably intermittent wipers, Voltmeter, and Wi-Fi Vehicle Hot Spot.Awards:* ALG Residual Value AwardsWe offer Market Based Pricing, please call to check on the availability of this vehicle. We'll buy your vehicle even if you don't buy ours. All vehicles are plus TT&L **HOME OF LIFETIME POWERTRAIN WARRANTY ON ALL NEW RAM'S! **EVERY PREOWNED VEHICLE HAS AT LEAST 7/32 OF TIRE TREAD AND AT LEAST 70% BRAKE LIFE REMAINING, OR WE WILL REPLACE IT. **12/12K MI WARRANTY ON ALL USED VEHICLES UNDER 75K MI. 2018 Maserati Quattroporte Nero Noctis Black S RWD ZF 8-Speed Automatic 3.0L V6 3.0L V6.THIS VEHICLE INCLUDES THE FOLLOWING FEATURES AND OPTIONS: 3.0L V6, 10 Speakers, 4-Wheel Disc Brakes, ABS brakes, Adaptive suspension, Air Conditioning, AM/FM radio: SiriusXM, Anti-whiplash front head restraints, Auto tilt-away steering wheel, Auto-dimming door mirrors, Auto-dimming Rear-View mirror, Automatic temperature control, Bumpers: body-color, Delay-off headlights, Driver door bin, Driver vanity mirror, Dual front impact airbags, Dual front side impact airbags, Electronic Stability Control, Exterior Parking Camera Rear, Four wheel independent suspension, Front anti-roll bar, Front Bucket Seats, Front Center Armrest, Front dual zone A/C, Front reading lights, Garage door transmitter, harman/kardon® Speakers, Heated door mirrors, Heated front seats, High intensity discharge headlights: Bi-Xenon, Illuminated entry, Leather Shift Knob, Low tire pressure warning, Memory seat, Navigation System, Occupant sensing airbag, Outside temperature display, Overhead airbag, Overhead console, Passenger door bin, Passenger vanity mirror, Power door mirrors, Power driver seat, Power moonroof, Power passenger seat, Power steering, Power windows, Radio data system, Radio: AM/FM w/Maserati Touch Control Plus & Nav, Rain sensing wipers, Rear anti-roll bar, Rear fog lights, Rear reading lights, Rear seat center armrest, Rear window defroster, Remote keyless entry, Security system, Speed control, Speed-sensing steering, Speed-Sensitive Wipers, Split folding rear seat, Steering wheel memory, Steering wheel mounted audio controls, Sun blinds, Tachometer, Telescoping steering wheel, Tilt steering wheel, Traction control, Trip computer, Turn signal indicator mirrors, Variably intermittent wipers, Voltmeter, and Wi-Fi Vehicle Hot Spot.Awards:* ALG Residual Value AwardsWe offer Market Based Pricing, please call to check on the availability of this vehicle. We'll buy your vehicle even if you don't buy ours. All vehicles are plus TT&L **HOME OF LIFETIME POWERTRAIN WARRANTY ON ALL NEW RAM'S! **EVERY PREOWNED VEHICLE HAS AT LEAST 7/32 OF TIRE TREAD AND AT LEAST 70% BRAKE LIFE REMAINING, OR WE WILL REPLACE IT. **12/12K MI WARRANTY ON ALL USED VEHICLES UNDER 75K MI. 2018 Maserati Quattroporte Grigio S RWD ZF 8-Speed Automatic 3.0L V6 3.0L V6.THIS VEHICLE INCLUDES THE FOLLOWING FEATURES AND OPTIONS: 3.0L V6, 10 Speakers, 4-Wheel Disc Brakes, ABS brakes, Adaptive suspension, Air Conditioning, AM/FM radio: SiriusXM, Anti-whiplash front head restraints, Auto tilt-away steering wheel, Auto-dimming door mirrors, Auto-dimming Rear-View mirror, Automatic temperature control, Bumpers: body-color, Delay-off headlights, Driver door bin, Driver vanity mirror, Dual front impact airbags, Dual front side impact airbags, Electronic Stability Control, Exterior Parking Camera Rear, Four wheel independent suspension, Front anti-roll bar, Front Bucket Seats, Front Center Armrest, Front dual zone A/C, Front reading lights, Garage door transmitter, harman/kardon® Speakers, Heated door mirrors, Heated front seats, High intensity discharge headlights: Bi-Xenon, Illuminated entry, Leather Shift Knob, Low tire pressure warning, Memory seat, Navigation System, Occupant sensing airbag, Outside temperature display, Overhead airbag, Overhead console, Passenger door bin, Passenger vanity mirror, Power door mirrors, Power driver seat, Power moonroof, Power passenger seat, Power steering, Power windows, Radio data system, Radio: AM/FM w/Maserati Touch Control Plus & Nav, Rain sensing wipers, Rear anti-roll bar, Rear fog lights, Rear reading lights, Rear seat center armrest, Rear window defroster, Remote keyless entry, Security system, Speed control, Speed-sensing steering, Speed-Sensitive Wipers, Split folding rear seat, Steering wheel memory, Steering wheel mounted audio controls, Sun blinds, Tachometer, Telescoping steering wheel, Tilt steering wheel, Traction control, Trip computer, Turn signal indicator mirrors, Variably intermittent wipers, Voltmeter, and Wi-Fi Vehicle Hot Spot.Awards:* ALG Residual Value AwardsWe offer Market Based Pricing, please call to check on the availability of this vehicle. We'll buy your vehicle even if you don't buy ours. All vehicles are plus TT&L **HOME OF LIFETIME POWERTRAIN WARRANTY ON ALL NEW RAM'S! **EVERY PREOWNED VEHICLE HAS AT LEAST 7/32 OF TIRE TREAD AND AT LEAST 70% BRAKE LIFE REMAINING, OR WE WILL REPLACE IT. **12/12K MI WARRANTY ON ALL USED VEHICLES UNDER 75K MI. 2019 Maserati Quattroporte Grigio S RWD ZF 8-Speed Automatic 3.0L V6 3.0L V6.THIS VEHICLE INCLUDES THE FOLLOWING FEATURES AND OPTIONS: 3.0L V6, 10 Speakers, 4-Wheel Disc Brakes, ABS brakes, Adaptive suspension, Air Conditioning, AM/FM radio: SiriusXM, Anti-whiplash front head restraints, Auto High-beam Headlights, Auto tilt-away steering wheel, Auto-dimming door mirrors, Auto-dimming Rear-View mirror, Automatic temperature control, Brake assist, Bumpers: body-color, Delay-off headlights, Driver door bin, Driver vanity mirror, Dual front impact airbags, Dual front side impact airbags, Electronic Stability Control, Exterior Parking Camera Rear, Four wheel independent suspension, Front anti-roll bar, Front Bucket Seats, Front Center Armrest, Front dual zone A/C, Front reading lights, Garage door transmitter, harman/kardon® Speakers, Heated door mirrors, Heated front seats, Illuminated entry, Knee airbag, Leather Shift Knob, Leather steering wheel, Low tire pressure warning, Memory seat, Navigation System, Occupant sensing airbag, Outside temperature display, Overhead airbag, Overhead console, Passenger door bin, Passenger vanity mirror, Power door mirrors, Power driver seat, Power moonroof, Power passenger seat, Power steering, Power windows, Radio data system, Radio: AM/FM w/Maserati Touch Control Plus & Nav, Rain sensing wipers, Rear anti-roll bar, Rear fog lights, Rear reading lights, Rear seat center armrest, Rear window defroster, Remote keyless entry, Security system, Speed control, Speed-sensing steering, Speed-Sensitive Wipers, Split folding rear seat, Steering wheel memory, Steering wheel mounted audio controls, Sun blinds, Tachometer, Telescoping steering wheel, Tilt steering wheel, Traction control, Trip computer, Turn signal indicator mirrors, Variably intermittent wipers, and Voltmeter.We offer Market Based Pricing, please call to check on the availability of this vehicle. We'll buy your vehicle even if you don't buy ours. All vehicles are plus TT&L **HOME OF LIFETIME POWERTRAIN WARRANTY ON ALL NEW RAM'S! **EVERY PREOWNED VEHICLE HAS AT LEAST 7/32 OF TIRE TREAD AND AT LEAST 70% BRAKE LIFE REMAINING, OR WE WILL REPLACE IT. **12/12K MI WARRANTY ON ALL USED VEHICLES UNDER 75K MI. 2018 Maserati Quattroporte Nero Noctis Black GT S RWD ZF 8-Speed Automatic 3.8L V8 Twin Turbocharged 3.8L V8 Twin Turbocharged.THIS VEHICLE INCLUDES THE FOLLOWING FEATURES AND OPTIONS: 3.8L V8 Twin Turbocharged, 10 Speakers, 4-Wheel Disc Brakes, ABS brakes, Active Shift Paddles, Adaptive suspension, Adjustable pedals, Air Conditioning, AM/FM radio: SiriusXM, Anti-whiplash front head restraints, Auto tilt-away steering wheel, Auto-dimming door mirrors, Auto-dimming Rear-View mirror, Automatic temperature control, Bumpers: body-color, Delay-off headlights, Door auto-latch, Driver door bin, Driver vanity mirror, Dual front impact airbags, Dual front side impact airbags, Electronic Stability Control, Exterior Parking Camera Rear, Four wheel independent suspension, Front anti-roll bar, Front Bucket Seats, Front Center Armrest, Front dual zone A/C, Front reading lights, Garage door transmitter, harman/kardon® Speakers, Heated door mirrors, Heated front seats, Heated rear seats, High intensity discharge headlights: Bi-Xenon, Illuminated entry, Leather Shift Knob, Low tire pressure warning, Memory seat, Navigation System, Occupant sensing airbag, Outside temperature display, Overhead airbag, Overhead console, Passenger door bin, Passenger vanity mirror, Pedal memory, Power door mirrors, Power driver seat, Power moonroof, Power passenger seat, Power steering, Power windows, Radio data system, Radio: AM/FM w/Maserati Touch Control Plus & Nav, Rain sensing wipers, Rear anti-roll bar, Rear fog lights, Rear reading lights, Rear seat center armrest, Rear Window Blind, Rear window defroster, Remote keyless entry, Security system, Speed control, Speed-sensing steering, Speed-Sensitive Wipers, Split folding rear seat, Steering wheel memory, Steering wheel mounted audio controls, Sun blinds, Tachometer, Telescoping steering wheel, Tilt steering wheel, Traction control, Trip computer, Turn signal indicator mirrors, Variably intermittent wipers, Voltmeter, and Wi-Fi Vehicle Hot Spot.Awards:* ALG Residual Value AwardsWe offer Market Based Pricing, please call to check on the availability of this vehicle. We'll buy your vehicle even if you don't buy ours. All vehicles are plus TT&L **HOME OF LIFETIME POWERTRAIN WARRANTY ON ALL NEW RAM'S! **EVERY PREOWNED VEHICLE HAS AT LEAST 7/32 OF TIRE TREAD AND AT LEAST 70% BRAKE LIFE REMAINING, OR WE WILL REPLACE IT. **12/12K MI WARRANTY ON ALL USED VEHICLES UNDER 75K MI. New vehicle pricing includes all offers and incentives. Tax, Title and Tags not included in vehicle prices shown and must be paid by the purchaser. While great effort is made to ensure the accuracy of the information on this site, errors do occur so please verify information with a customer service rep. This is easily done by calling us at 386-271-3583 or by visiting us at the dealership. Maserati Alfa Romeo of Daytona	29.2145943, -81.1042837.